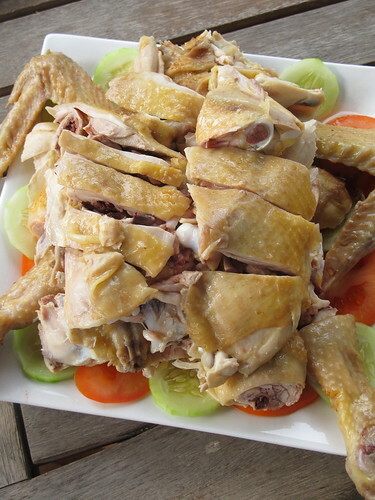 Ya, i have one extra step is after chicken is done, i brush salt on the body of chicken, so it taste like salted chicken, yummy! 1. Stuff ginger and spring onion inside the cavity of chicken. 2. 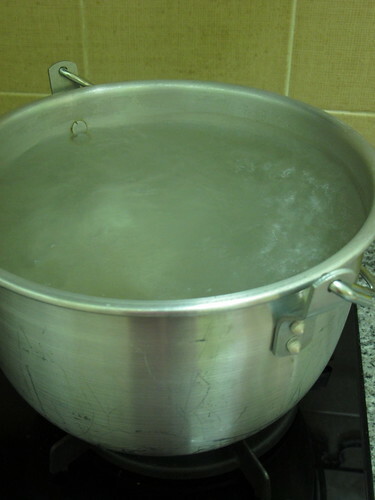 Boil a large pot of water over high heat ( use a pot that large enough to fit a whole chicken). 3. 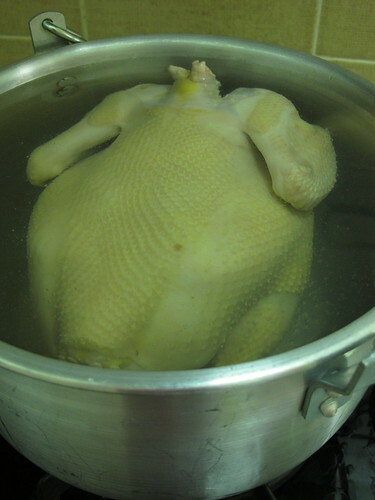 Slowly place the chicken (breast side down ) into boiling water, boiling water become simmer. 4. 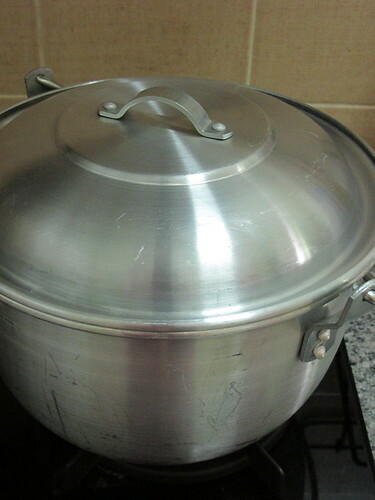 Once water boil again, reduce heat to the lowest. 5. Cover the lid and let chicken simmer in hot water. While cooking half way (about 10mins), flip the chicken breast side up, cover and continue simmer. 6. Cook for 16mins (depend the size of chicken or when you see chicken become light and float on top). 7. Switch off the fire, cover the lid and let chicken continue to simmer in hot water for another 10mins. 8. Mix salt and sesame oil in a mixing bowl. 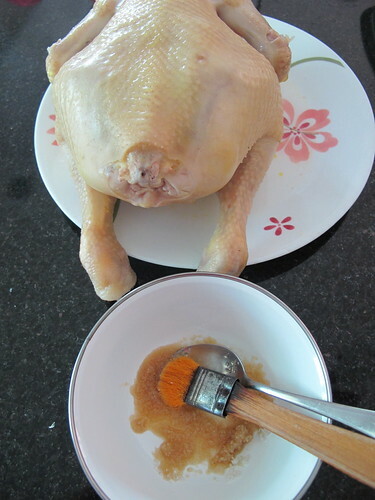 Remove chicken from hot water, use a brush to evenly brush salt mixture on the whole body of chicken. 9. Let it cool in room temperature for several hours (5-6 hours) before chop into small pieces. I consider myself still not chop a perfect white cut chicken, but these are how i usually chop the chicken. Beside just serving white cut chicken as a main dish, sometime i prepare into Hainanese chicken rice or like today i cook into Kuoy Teow noodles soup..
joceline called me while she left a message here and we start to gossip abt u, hahahaha! here are some contents : 'aiyo, this sonia why everyday so rajin, her brain must be very good, can 变so many type of dishes everyday, photos also sui sui， really pandai'. Hahahaha, lovely comment right? My whole family and I loves "Pak Cham Kai" ~ well we are hainanese that's why! 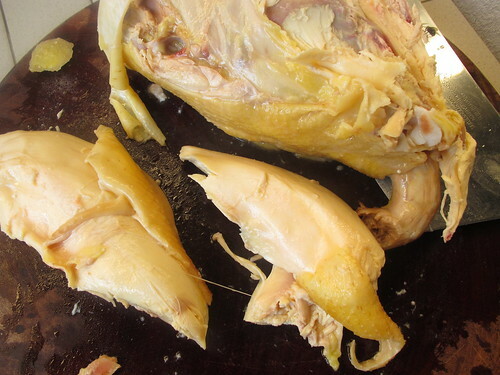 Sometimes we thought making this chicken is easy, but there's a way to cook till it is full cooked till no blood visible after cut. You done so well in cooking this dish as well as cutting it to pieces. So much to learn from you. Your chicken look so tender and moist and the colour is very beautiful too. And I totally agree with EileenLee - you are so diligent and creative in the kitchen. Keep up the good work. 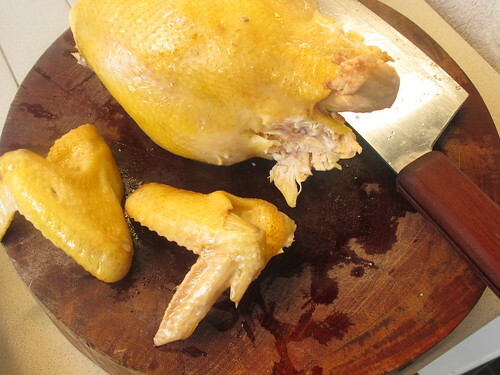 Thanks for sharing the step by step method of poaching a chicken. Look beautiful! tq for sharing.... senang nak ikut, step by step! Oh I so want to come to your home where I would gladly let you cook up a banquest of delicious dishes for me including this one. Something simple and yet need skills to prepare. Thanks for all the step by step photos. I hope somebody is taking those photos for you. I want to go to your place for dinner!!!! haha. That looks so good, Sonia! Thanks for sharing! Definitely will try it one day! Love your version Of the poached chicken!This just reminds me of my mum's chicken,hahaha! I love to eat "pak cham kai" too... my mum makes a special sauce whenever she cooks this. YUMS. So glad that you sharing the steps. I used kg chicken no wonder looks different from chicken rice shop..hehe. I always buy kg chicken doesnt know others type of chicken..thanks for mentioned holland kai hehe..will try it out. Btw can i cook the chicken in the soup base with ingredient like cabbage or some red dates? when I visited ur blog just now I was about to have my dinner, and...suddenly felt very very hungry. Wanted to eat ur poached chicken instead of my pizza. 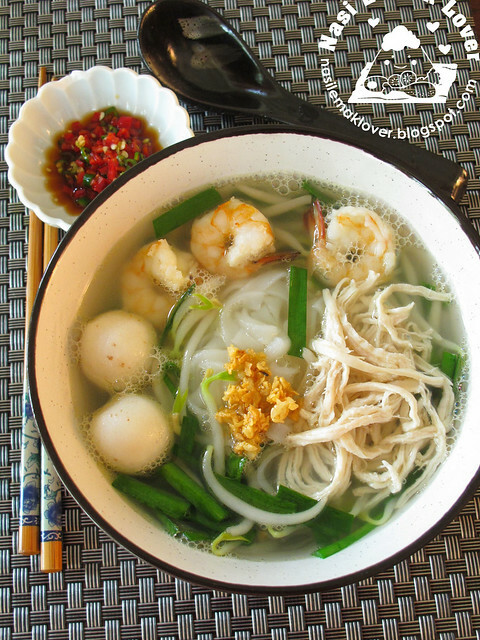 Look so yummy, especially the kuay teow soup! 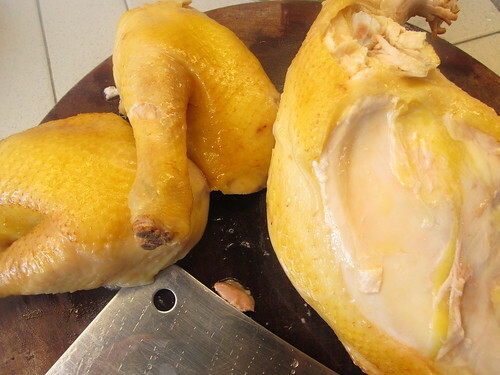 How did you make the chicken skin so yellow in colour? Jes, I suggest not to add cabbage and red dates first, once chicken removed, you can continue to cook and add these ingredients. Like the kuoy teow soup i prepared , I add yam bean, chicken carcass , chicken feet and an onion after removed the chicken. Fern, I think partly due to I added the sesame oil and the skin turn darker and look yellow after several hours in room temperature. Look nice! Sometimes is not easy find a whole chicken look delicious!! Sonia kak Ros suka.This malay kakak memang punya selera cina lol...ayam ni susah nak dapat yang halal.kak Ros pasti nak cuba. harap2 my lokong(betul ke ejaan tu??) suka dan senyum sampai ke telinga bila kak ros masak ni. saya suka. saya suka... slruup! Look so delicious! But I can't cook this because my husband doesn't like 白切鸡! I can't chop a chicken properly, usually don't loook much like chicken after that. Hi Sonia, your pak cham kai look delicious. Love the silky skin, yum yum... Thanks for sharing the tips, usually I steam instead of poach. Nice to dip in coriander leaves sauce. 1 bunch of fresh coriander leaves chopped. Fried shallot until golden brown, lower the fire, add oyster sauce, little water,sugar, salt, black sauce, sesame oil to taste. Add in the coriander leaves, mixed well and remove from stove. It taste excellent with this chicken. Enjoy. Sonia, love the tips about the "pak cham kai". Sesame and salt mixture can make the skin turn our nicely. thanks for sharing. Amelia, Thank you for sharing your special coriander sauce recipe, sound so yummy! Hi Sonia, thanks so much for sharing your step by step instructions with illustrations! This is great for someone who has no one to learn cooking skills from, I have never tried poaching a whole chicken as I dont know how to chop the chicken ;) but with your clear instructions, I will love to give it a try, but for a start I may use a kitchen scissors ;) or bring the whole chicken to my sis place to ask her to chop for me! 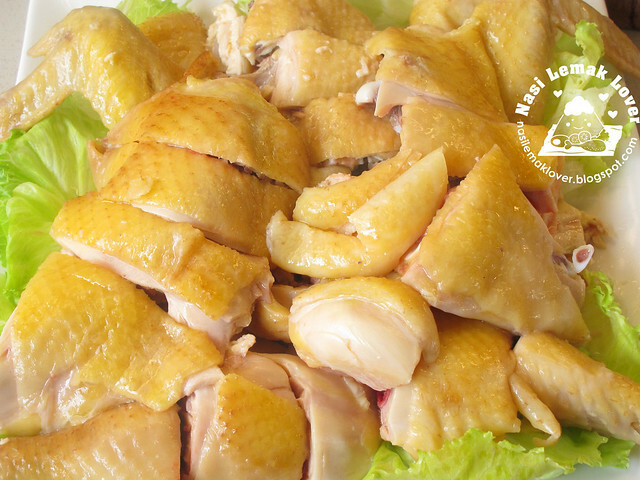 the chicken meat look very tender,and the color is nice~ thanks for sharing! The last time i made hainanese chicken rice, I boiled the chicken like you did but brushed it with light soya sauce mixed with all spice and steamed the chicken for another 20 minutes. But i used the ordinary chicken, the one that we simply get from the market. Next time, i'll follow your style. Thanks for sharing your recipe. Looks moist and tender. I don't know whether it helps or not- for our family, after removing from heat, we put the whole chicken in some ice water for a while - to stop the cooking. Sonia, your kids, your husband and your family are so blessed to have you. I love all those food on the table, especially the noodle soup. Love your recipe "pak cham gai", will try that. :) Can you pls share also how to make the chilli sauce for this "pak cham gai"?? Thanks. Jade, my chili sauce is very simple, blend fresh chili,chili padi(if want hot), (garlic and young ginger-not too much), limau kasturi rind and juices, seasonings with salt and sugar, add little bit chicken stock, and let it warm in the rice cooker. the way I know is to dunk the chicken in cold water right after it's done to stop the cooking! 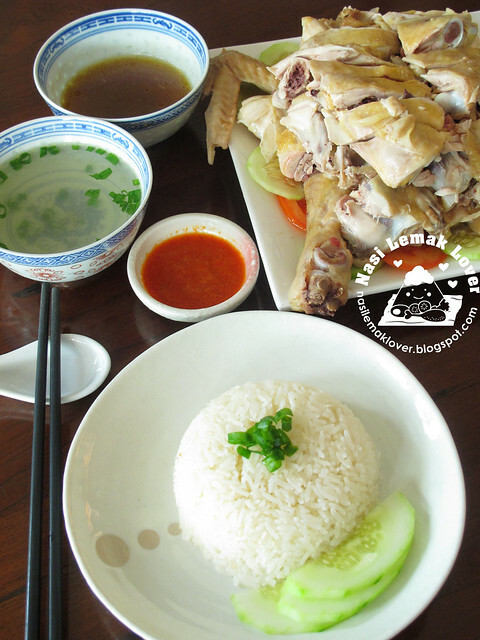 this chicken looks nice and tender, I love chicken rice!! I also love 白切鸡! When I poached the chicken, I like to add one onion and one stick English celery in the water. You have no idea how practical this post is for me! This is the way I should have cooked chicken for my Bang Bang Chicken (I think the cookery book I took it from advises the same method and ingredients). Your chicken looks tender and juicy... Thanks for sharing this great tutorial. 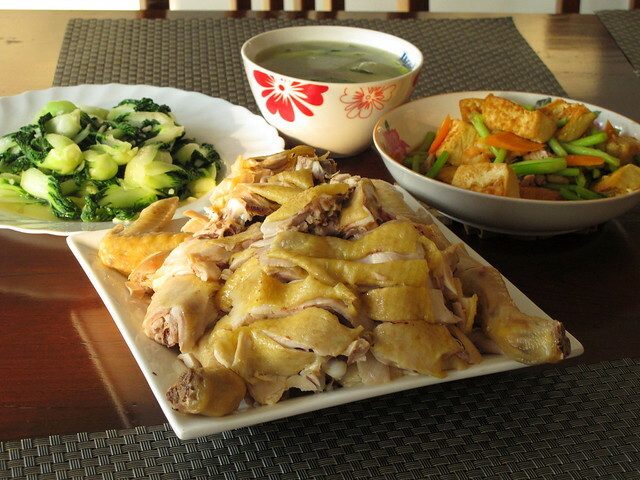 my mum also poached the chicken like your method, sometimes i follow but sometimes so lazy just steam it right away. Most of the time we use wu soh kai. Yes, Sonia, I agreed with u for not using the kampung chicken in making white cut chicken....less meat & the meat also too springy. some even very elastic till the false teeth also came out! haha.... Thanks for sharing the tips & enjoy your weekend, momsie. because it is only hubby and myself, i often do the shortcut way and just use pieces of chicken. You reminded me how juicy a WHOLE chicken will taste like! oh my Sonia!! You make it just like a pro!! Is this how they make Hainanese Chicken Rice in the hawker centres? I never knew they used such simple ingredients!! I love it! 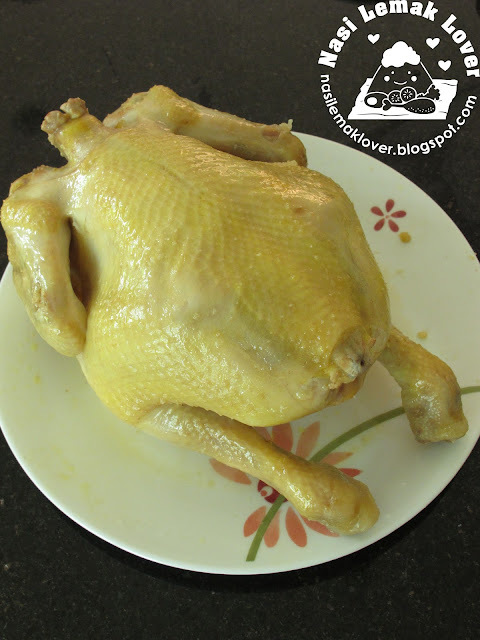 Love roasted chicken, great recipe! The chicken you prepared looked absolutely lovely..
That's a such simple recipe with a clear picture ! 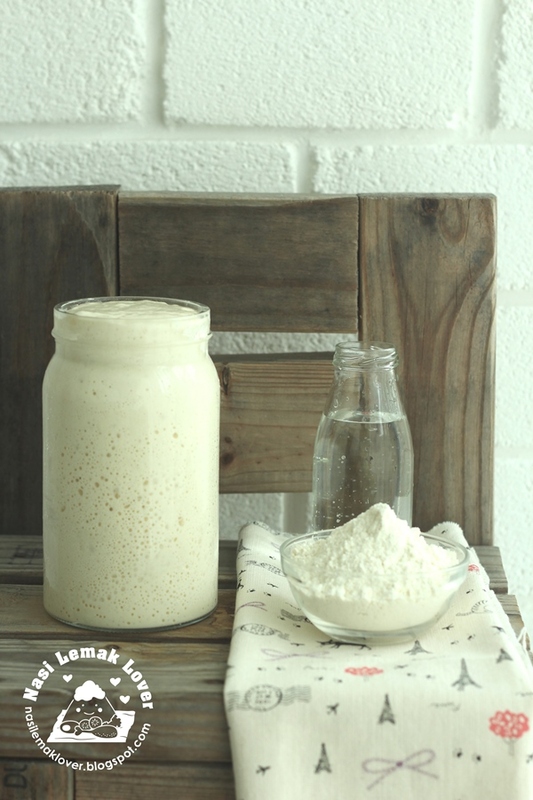 Will try this recipe . 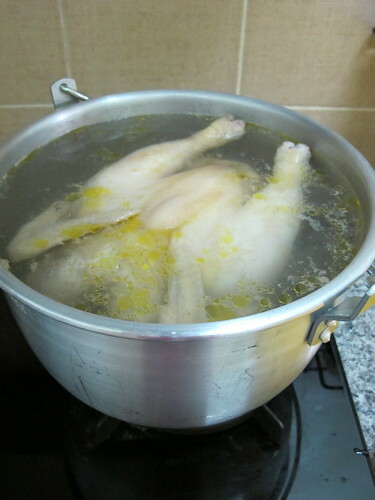 For really moist flesh chicken with very slightly pinkish flesh to the bone, place the chicken in a large pot of boiling water, previously boiled together with some ginger and sea salt. Ensure chicken is completely covered in the water. Simmer for 3 minutes. Then switched off heat, and let chicken soaked in the pot for about 40 - 60 mins depending on chicken size (approx 1.2 - 1.7kg). 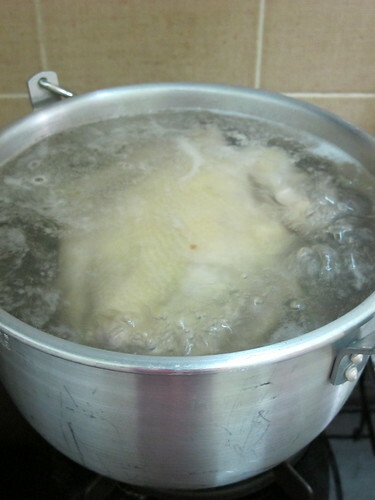 After cooking time is completed, remove chicken and plunge it into cold ice water. This will gel up the collagen in the flesh and produce a really tender "pak chum kai" with moist flesh even in the breast portion.